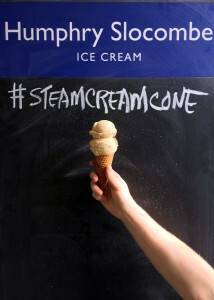 By now you may have noticed the mutual infatuation Anchor Brewing and Humphry Slocombe have for one another, two San Francisco companies working to delight the taste buds with suds and sweets. Anchor Steam Beer is America’s first craft beer and San Francisco’s original since 1896. Humphry Slocombe’s “ice cream for adults” pushes the boundaries of cold, sweet treats with flavors like Secret Breakfast (bourbon and corn flake) and Jesus Juice Sorbet (red wine, cinnamon, and Coca-Cola). For a few years now, Anchor and Humphry Slocombe have partnered to create delicious beer ice cream flavors using beers such as Go West! IPA, Anchor Porter, Anchor Saison, Flying Cloud SF Stout, and more! July 16 is National Ice Cream Day and what better way to celebrate then with a cone of Humphry Slocombe’s Anchor Steam Cream! We’ve got the recipe so you can make it and celebrate#NationalIceCreamDay with us! Feeling adventurous? Drop a scoop of Anchor Steam Cream into a pint glass and fill it with Anchor Steam Beer for a delicious Steam Beer Float! In a large, heavy-bottomed, nonreactive saucepan over medium heat, combine the beer, molasses and brown sugar and cook, stirring often, until reduced by half, 15 to 20 minutes. It should be slightly sticky to the touch. Add the salt and stir to dissolve. Add the cream and milk and cook, stirring occasionally, until hot but not boiling. Transfer the yolk mixture back to the saucepan with the remaining cream mixture and return to medium heat. Cook, stirring constantly with a rubber spatula (be sure to scrape the bottom of the saucepan so it doesn’t scorch) until the liquid begins to steam and you can feel the spatula scrape against the bottom of the pan, 2 to 3 minutes. When the custard has completely cooled, cover the bowl tightly and chill in the refrigerator for at least 1 hour or preferably overnight. When you are ready to freeze the custard, transfer it into an ice cream maker, add 4 oz. of Anchor Steam® Beer, and spin according to the manufacturer’s instructions. Eat immediately or freeze for up to 1 week. If you want to get really crazy, make a beer float with Anchor Steam Beer- yum! Can’t get enough beer ice cream? 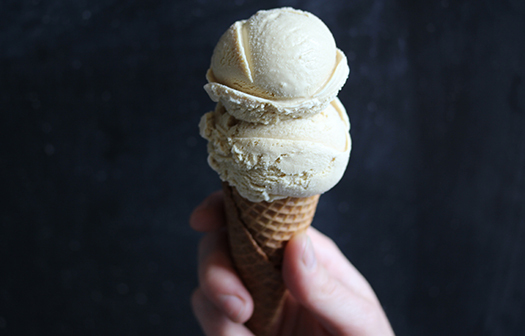 Check out Humphry Slocombe’s Flying Cloud SF Stout Ice Cream recipe too!